COPS swimmers who won in the National Arena League fixture. From the left they are Poppy Richardson, Mollie Allen, Daniel Leigh and Rebecca Burton. City of Peterborough Swimming Club (COPS) remain in the hunt for a place at the big National Arena Swimming League cup final. They needed to win the penultimate fixture - a home one at the Regional Pool - to stay in contention for the big season-ending finale and they did so in style. They won 21 of the 50 events (nine relays and 12 individual races) to finish 40 points clear of West Suffolk. The final result of COPS A 247 points, West Suffolk 207, UEA Norwich 203, West Norfolk 182, Sherwood Colliery 116 and Deepings 93 saw them climb above Norwich into third place behind Northampton and City of Milton Keynes. Now they must beat Milton Keynes and win by 20 clear points in the final round at Cambridge to once again represent the East Midlands division at the final, which features the top 10 best clubs in the country and is regarded as swimming’s FA Cup final. Mollie Allen picked up a hat-trick of individual wins and Rebecca Burton two. Taking first place for COPS A were: Mollie Allen (18) 200m individual medley, 100m backstroke and freestyle; Rebecca Burton (18) 100m butterfly and breaststroke; Zane Day (10) 50m backstroke; Jade Goode (13)100m butterfly; Herbie Kinder (14) 100m backstroke; Daniel Leigh (17) 100m butterfly; Harvey Norman (15) 100m breaststroke; Poppy Richardson (15) 100m butterfly; Myles Robinson-Young (14) 100m freestyle; Jessica Shaw (11) 50m butterfly and Tom Wiggins (17) 100m breaststroke. 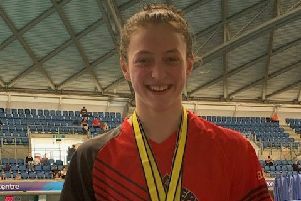 Also swimming for COPS A were: Anna Blakeley (13), Jack Brown (13), Jessica Mahoney (11), Matthew Newson (13), Bert Papworth (11), Maddison Saunders (15), Jamie Scholes (16), Josh Smith (11), Will Steel (15), Connor Walker (12), Hallie White (12) and Eve Wright (13). COPS B travelled to Bletchley and achieved five wins (two relay and three individual. The final positions were Milton Keynes 250 points, City of Cambridge 207, Nottingham Leander 191, Modernians 162, COPS B 154, Bramcote 78. COPS B individual winners: Mia Leech (14) 100m butterfly, Leah Roughan (17) 100m breastroke and Rachel Wellings (16) 100m freestyle. Also swimming for COPS B at Bletchley were: Lauren Browne (13), Fabien Brudnicki (12), Hannah Daley (12), Michael Drinkwater (11), Matthew Gray (16), Kieran Griffin (10), Sophie Griffin (12), Annastassja Herdien (11), Emma Leslie (15), Toby Norman (11), Henry Pearce (14), James Rothwell (12), Matthew Rothwell (14), Poppy Slater (11), George Whiteman (12), Harry Whiteman (16), Kenzie Whyatt (14) and Matthew Wouldham (15).